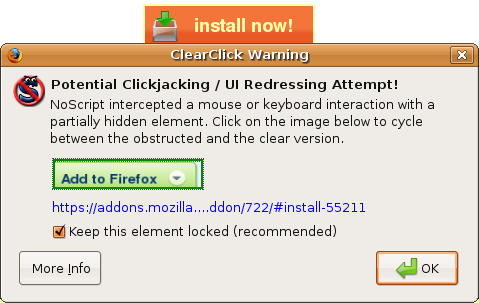 hackademix.net » Hello ClearClick, Goodbye Clickjacking! This entry was posted on Wednesday, October 8th, 2008 at 12:27 am and is filed under Clickjacking, Flash, Mozilla, Security, NoScript. You can follow any responses to this entry through the RSS 2.0 feed. Both comments and pings are currently closed. thanks, it's not the only typo in this release. Translators notified some more, they are all fixed in current trunk. I just want to thank you very much for creating NoScript. It's the only add-on I installed in Firefox, and it's probably in my top 5 of free software I'm using. Thank you! I noticed a problem with clearclick enabled for trusted sites. Try putting the focus in the message pane to scroll, ClearClick alerts you. I notice that the default setting for NoScript's ClearClick feature only activates it for untrusted sites. Since I've had my own site hacked by Chineese hackers who put iframes on it, I think it might be best to also activate it for trusted sites, which is an option. There's an incompatibility between ClearClick and NewsFox (as version 1.0.3.1 with NoScript up-to-date). It detects when you clic on a website inside de feed reader as a clickjacking. I didn't know where to put bug reports, so here it is. I just installed 1.8.2.2, and decided to test it on the example you gave. If I click on the left side of the button, it shows just the download count, and white space if I toggle it. If I click on the right side of the button, it shows a wide area including the download count and the left side of the green download button, and just the left side of your button if I toggle it. I'm on XPSP2 with Win2K-style windows; don't know if that has any bearing on the issue. I also notice that ReCaptcha gives me several clickjacking warnings when I click on it. And I had to copy text to a textbox to use it. So what exactly does the "Keep this element locked" option do? The NoScript FAQ page and this completely fail to describe that option. For the record, I have NoScript applying its rules to trusted sites as well as untrusted ones, and I got this warning while trying to create a new tab (Ctrl-T) while using the Brief rss reader plugin. "Keep this element locked" does what it says, i.e. prevents free interaction with the element whose sight is "unclear". If you uncheck that option, you can interact freely with that element. Some false positive triggered either by extensions which, like Brief, mix chrome and content in frames have already been fixed in latest versions. I'm currently analyzing the ReCaptcha issue, which seems caused by a rendering glitch (the images differ for the thickness of a couple lines only). The good thing of ClearClick, BTW, is that you can actually compare the top and the bottom of your click area by yourself (clicking on the image shown in the dialog) and decide if it's a false positive or something you should be scared of with no need for specific technical knowledge. Hi, thx, clearClick triggered lots of warnings using Evernote, but seems to work ok now, thx! the current version 1.8.2.8 slightly degrades the acid3 test score, why? I am using the Firefox 3.1 beta version available here: http://tinyurl.com/4rz2fn (win32 installer) that normally scores a 97 on acid3 with no script disabled or using earlier noscript versions from a week or so ago. acid3 problem is FIXED on version 1.8.3 woohoo! Great extension. I have only one complain. Stop updating every day. It is annoying !!! Gather all fixes and/or futures an do it every 15-30 days. Every day that i open my browser NoScript is asking to Update. Each update is an improvement. And when it comes to security, I'm grateful for these numerous AND FAST improvements. The more the better. I have used No-Script since Firefox, and love it...great to see improvement in an already excellent product. Yes, I just got that update! loved it and blogged it!!! Thanks. NoScript is a wonderful addon. Could I get some more explanation of what is actually going on? I sometimes get clickjacking warnings on a site I often visit. Where can I get more information on what is going on and what the hijacked link is, so that I can make the decision whether to allow or not based on facts rather than on my hunch that the site is bona fide or that if NoScript says it's bad, it probably is. The simplest thing you can do is comparing the two images taken by NoScript (the one obstructed and the one "revealed") by clicking on the green-bordered box on the warning. If that seems a false positive, please try to install latest development build, and if the problem persists let me know where it happens. Thanks for the comment on my recent post about a possible false positive. I've posted the information to the forum with the screenshots. Please let me know if you need any other information. Thanks to NoScript it blocked clickjacking attempts from maps.google.com. It also blocked XSS attacks. What kind of douchey word is "interwebs"? es einem Angreifer bietet, haben Sie in den ersten beiden Folgen erfahren.